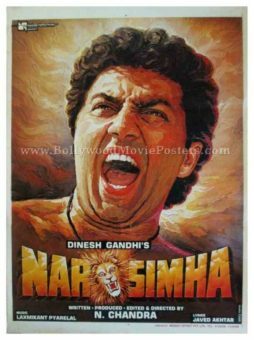 Classic Bollywood movie poster of the hit Hindi film, Narsimha (1991) for sale. Printed and circulated during the first release of the film (somewhere in the early 1990s), this classic Narsimha movie poster was originally designed for publicity of the film but never ended up being used. Narsimha was released at a time when movie poster design techniques in India had almost completely shifted from handmade to digital. This rare Narsimha movie poster which features a brilliant hand painted portrait of Sunny Deol is one among few surviving hand painted Bollywood posters from the 1990s, making it highly collectible! Do not miss this chance to own this rare piece of Indian cinematic history. Very few posters remaining in stock! This classic Bollywood movie poster features a brilliant hand painted portrait of Sunny Deol. The poster features interesting typography – the face of a lion is seen in the movie title. Hand drawn Bollywood poster of the hit action drama Pratighaat (1987) for sale. This is an actual surviving vintage movie poster of the 1987 Hindi film directed by N. Chandra that featured Sujata Mehta in the lead role. Printed and circulated a few years after the first release of the film (somewhere in the 1990s), this hand drawn Bollywood poster was printed for publicity of the film but never ended up being used. This poster was originally designed on a hand drawn canvas by a small time art studio in Kolkata, making it highly collectible. A very colorful, quirky hand drawn portrait of the lead actress is seen wielding an axe, suggesting the ‘hell hath no fury like a woman scorned’ plot of the film. 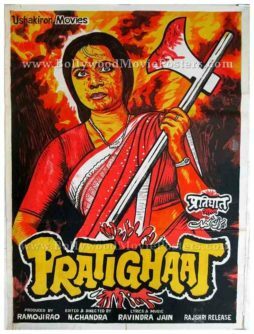 Pratighaat (1987) is an action packed old Hindi drama written and directed by N. Chandra starring Sujata Mehta in the lead role. The film essays the struggle of a woman who takes on the mafia that rules the city.